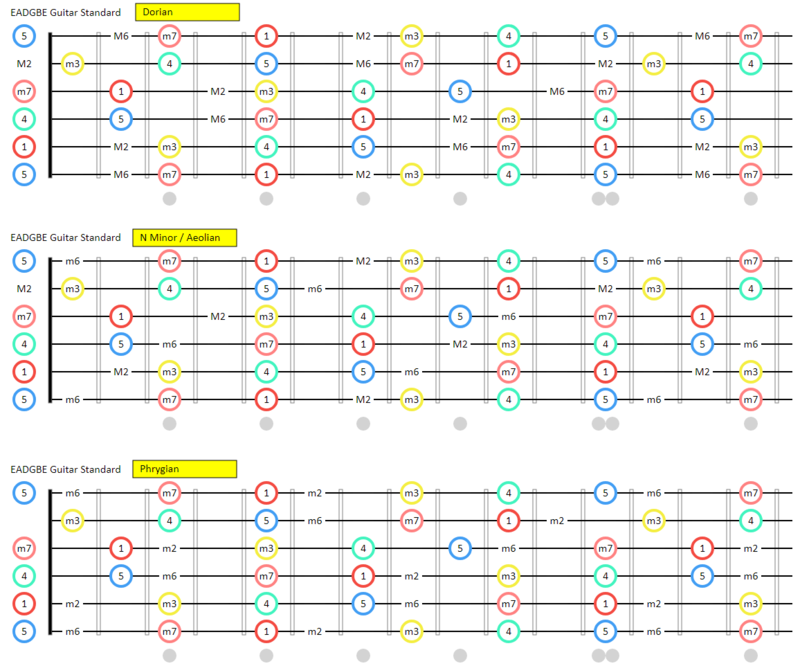 Mike Hadlow has created an awesome dashboard for understanding, learning and playing scales/modes on guitar. This could be a more dynamic alternative to the guitar shapes posters I have on my wall. How to read the diagram above. First ignore the circles. Pretend they&apos;re completely not present. All that&apos;s left are some note names in small black letters. The author (Mike Hadlow) eschews the use of Roman numerals though, so instead of II and ii it says 2M and 2m (2 Major and 2 minor). Now consider the circles. The notes that are circled are the notes of "pentatonic minor". The root note has a red circle. The next note (a minor 3rd) has a yellow circle. Notice that the circled notes (pentatonic minor) are a subset of Dorian. And if you know your pentatonic minor (like many guitarists) you&apos;ll clearly see what you can add to pentatonic minor to get Dorian. The next diagram does the same for natural minor. (I already had a variation of this diagram on my wall) and the third does the same for Phrygian. Dorian, Natural Minor (Aeolian) and Phrygian are all subsets of minor. So they are minor modalities.